Bonded Premium Promotional Snack by Poca Reels in Customers! When you’re hungry, chances are you would look for a snack. However, which snacks would stand out for you? More often than not, it would be a snack with a promotion that attracts you to it. Here’s where Poca Vietnam comes into play! At the supermarket, Poca uses a bonded premium to promote its snacks. Together with its chips, there is also a packet of Cheetos waiting for the customer! Why do we like a bonded premium promotion? 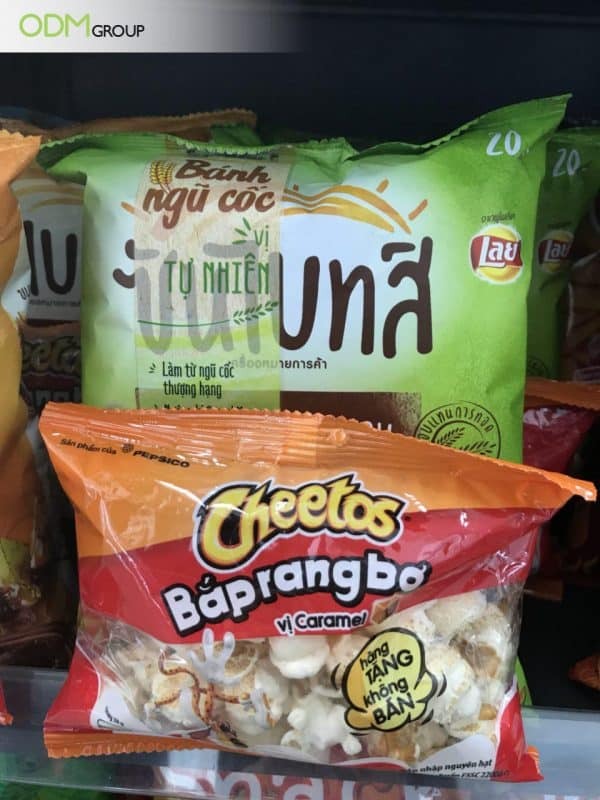 Increased product value: With the additional packet of Cheetos, customers will feel that they are getting more from their purchase. As opposed to simply having a packet of chips, the additional Cheetos acts as a complimentary gift with purchase. This will help to attract a potential customer to the product. Cost-effective: This promotional method is an extremely cost-effective way of promoting a product. There is no need to spend big amounts of money for this promotional method, as all that is needed would be an additional packet of Cheetos snacks. This means that your company will easily meet any marketing budgets. Visibility: Bonded premiums are extremely visible, as they certainly stand out. When a customer looks through a snack display, the snack with the premium will be the first thing that they see, as the additional snack is extremely prominent. Therefore, when used correctly, bonded premiums can bring about great benefits for your company. These benefits would certainly lead to increased sales, which would be a key goal for any company. Aside from a bonded premium, there are many other promotional methods that your company can use. These include in pack offers, and the use of store displays. Would such promotions help your company? If so, The ODM Group is the perfect place for you! Feel free to contact us at any time! We specialize in design, manufacturing, and shipping! With us, you can ensure an easy and fast process for your company! Here are some other interesting promotional blogs for you to read! A simple, yet effective in pack offer by Sensodyne! A cool on pack offer by Maggi! Dove wows with a creative display!